A day called hope : a personal journey beyond depression by Gareth O'Callaghan. For years Gareth O'Callaghan, one of Ireland's most popular broadcasters, suffered severe depression. Now fully recovered and no longer on anti-depressants, he has emerged with a deep understanding of how depression takes hold - and how to loosen its grasp. Here he shares his insight, practical knowledge, and convictions in a mission to spread hope to all those affected by it. Accessible. Slim book. Compassionate and practical. CBT strategies and more. Good first book. Using the vivid, poignant and personal stories of the members of a website support group she founded (www.depressionfallout.com), Anne Sheffield, the author of two highly acclaimed books on depression, provides an honest record of what happens to a love relationship once depression enters the picture, and offers solid advice on what the non-depressed partner can do to improve his or her own life and the relationship. 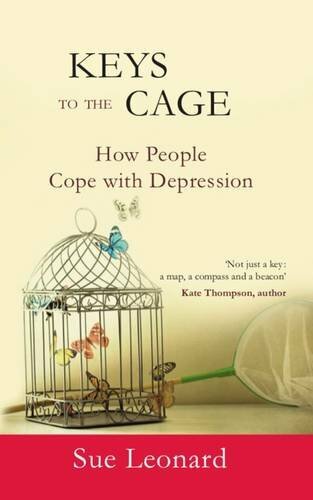 This best-selling book, written by a leading consultant psychiatrist, explains that people with depression do battle with pressures and stresses that other people would run away from, until their bodies can take no more. In this book, depression is placed authoritatively as a physical illness, from which recovery is possible. Large but easy to read CBT book. Also covers panic, phobias, guilt, inferiority. Has demonstrated effectiveness in clinical trials. We live in stressful times and have to cope on a daily basis with a variety of different pressures. These can include financial worries, emotional stresses, bereavement, break-up of relationships and insecurity at work. When feeling well and resilient we are able to cope with a wide range of these stressful situations. It is when we become mentally and emotionally overloaded at a vulnerable time in our lives that we can suffer from symptoms of anxiety or depression. How to cope successfully with depression by Tom Smith. Written by a specialist, this volume in the BMA FAMILY DOCTOR GUIDES has an authoritative and accessible text. It is completely up-to-date, including the latest advances in the diagnosis and treatment of depression and contains practical self-help advice, preventive measures and a list of useful addresses. This book is about depression in Ireland and chronicles the experiences of 14 different people from all walks of life. Each account is painstakingly honest, but even more than that, it has clearly taken exceptional bravery for each sufferer to tell his/her story. For anyone who has or is suffering from depression, you will never again feel alone in your struggle. For those who haven't, it will give you a great insight into an illness that is very often dismissed or misunderstood. A book of great hope and great courage. If you've ever struggled with depression, take heart. Mindfulness, a simple yet powerful way of paying attention to your most difficult emotions and life experiences, can help you break the cycle of chronic unhappiness once and for all. Through insightful lessons drawn from both Eastern meditative traditions and cognitive therapy, they demonstrate how to sidestep the mental habits that lead to despair, including rumination and self-blame, so you can face life's challenges with greater resilience. Undoing depression : what therapy doesn't teach you and medication can't give you by Richard O'Connor. Anyone who has learned to do depression can learn how to undo it. Recognising that medication is not a magic cure, Undoing Depression offers a range of therapies, from exercise to self-help and psychotherapy, and includes entirely new chapters on using meditation and the role of stress. O Connor offers new hope and new life for sufferers of depression. Anxiety & Depression Workbook For Dummies provides readers with practical exercises and worksheets to help them analyse their thinking patterns and overcome the issues that are holding them back. The workbook format is ideal for those wanting to track their progress and make positive changes to both their mental and physical health. Drawing on recent developments in the science of mood--and his own harrowing depressive experience as a young adult--Rottenberg explains depression in evolutionary terms, showing how its dark pull arises from adaptations that evolved to help our ancestors ensure their survival. The Depths offers a bold new account of why depression endures--and makes a strong case for de-stigmatizing this increasingly common condition. In so doing, Rottenberg offers hope in the form of his own and other patients recovery, and points the way towards new paths for treatment. 'I was nearly twenty before I understood that there was a name for what sometimes happened to me. Later, I learned that it has gone by many names - the black dog, the bell jar, the noonday demon, darkness visible, malignant sadness - but in my teens I'd just assumed that my fierce highs and days of disproportionate, isolating despair were part of every teenager's repertoire - how else would Morrissey have sold so many records? Beautifully written and intensely honest this is an extraordinarily moving, life-affirming book about a debilitating illness that affects one in six people in the UK alone. Ayurveda is the worlds oldest system of natural medicine, originating in India thousands of years ago. Yoga, now practiced by tens of millions of Americans, is derived from it. This unique book reveals the ancient yet ultramodern Ayurvedic perspective on depression. Filled with time-tested techniques to untangle the root of depression, it offers a holistic approach that includes wisdom on yoga, breathing techniques, meditation, nutrition, exercise, lifestyle, and spirituality. When Caroline Carr’s partner of 20 years became depressed, it was a shock. But slowly she learnt the techniques she needed to cope without being dragged down herself, and was inspired to write this book. "Shoot the Damn Dog" blasts the stigma of depression as a character flaw and confronts the illness Winston Churchill called 'the black dog', a condition that humiliates, punishes and isolates its sufferers. It is a personal account of a journey through (and out of) severe depression, as well as being a practical book, offering ideas about what might help. Take the natural path to mental wellness More than 25 million Americans are treated with antidepressants each year, at a cost in excess of $50 billion. But the side effects of popular prescription drugs may seem nearly as depressing as the symptoms they’re meant to treat. Veteran yoga instructor Amy Weintraub offers a better solution—one that taps the scientifically proven link between yoga and emotional well-being as well as the beauty of ancient approaches to inner peace.